Not sure what coverages you need? As a FREE service to you, our knowledgable agents have spent years gathering the most useful information for your industry. 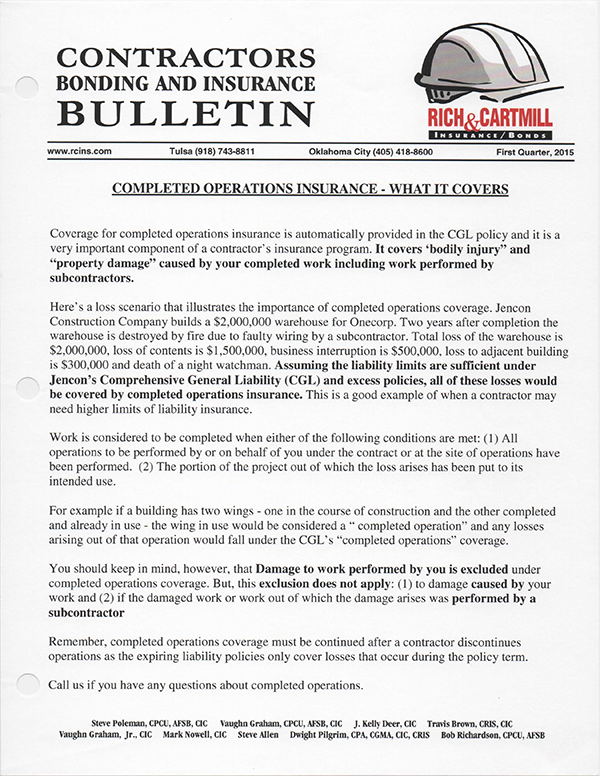 This information is contained in over 140 Construction Bulletins and are ready to be sent to you with one simple call. Select a bulletin category from the list below. Choose a bulletin topic (or as many as you wish). Contact the agent of your choice from the provided list, with your list of topics. Your bulletin(s) will be on their way to you in a snap! All agents are eager and ready to assist you with your needs. It’s simply the Rich & Cartmill way. Are You Covered for Use of a Non-Owned Vehicle? Business Vehicles: Are They Insured Properly? Builders Risk/Installation Floater – Are You Covered? Mobile Equipment – Where Should It be Covered? Mobile Equipment – Where Is Your Coverage? Contractual Liability – What Is It? Employment Practices Liability – Losses Are Pouring In! Completed Operations – What It Covers? Employers Liability – What’s It For Anyway? Umbrella/Excess Liability – How Much Is Enough? Annual Protection Review – A Must! Flood and Earthquake Question – Insure or Gamble? 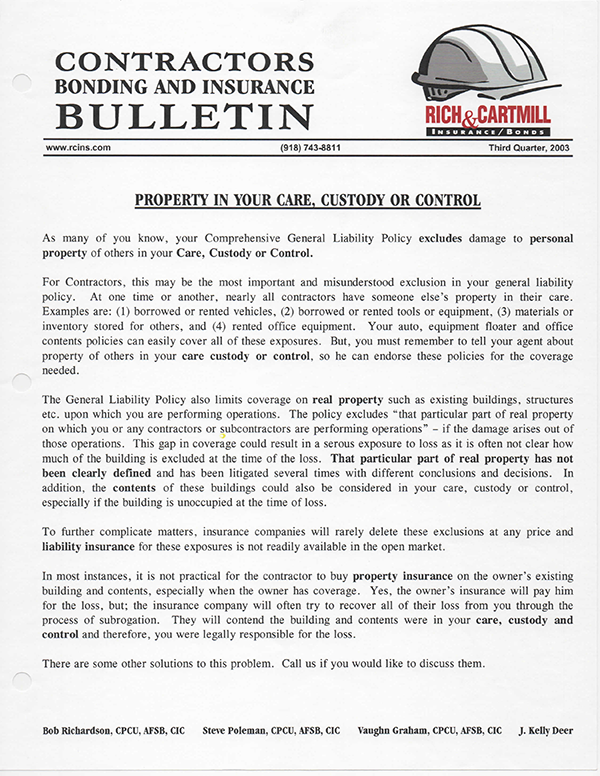 Building and Contents – What’s Your Insurable Value? Storm Damage – What If It Had Been Me? Are You Converted for Flood? Experience Modification – What Is It and How To Use It?